West Indies Crab Salad will take you to the islands when you close your eyes and use your imagination. Goodness, gracious. Such deliciosity. (Hmmm… I just made up that word.) This concoction is from Paths of Sunshine Cookbook. Make it at least a day ahead and let it marinate. From Jeanne Ustler and the Apopka Citizen Police Alumni Association’s Sharing Our Finest Cookbook, we find Chicken Salad Supreme. It lives up to its name. Doris Conduff’s Apricot Chicken is quick and simple and delicious. What more could we ask of this humble bird? Our gratitude goes to Northside Baptist Church for sharing Doris’ recipe with us. From Preserving the Big Potato, Lillian Cleghorn shares her Pork Chop and Potato Casserole. Lillian has lots of recipes, all wonderful, that she shares with her Apopka neighbors and friends. Carolyn Booth’s Appetizer Potato Skins is decadent! I can feel the pounds accruing around my middle from just reading about them! This recipe, compliments of the Apopka Historical Society, is found in their publication, Preserving the Big Potato. Asparagus Vinaigrette from Southern Living’s All-Time Favorites looks to be a terrific dish. Make it a day ahead and serve it cold. Impossible Pie. It sounds intriguing; I might just try it soon. This mysterious sounding pie comes to us from the Apopka Citizen Police Alumni Association’s Sharing Our Finest Cookbook, specifically from Nora Kinnison to whom we send our warmest thanks. Feeding the Flock brings us Wendy Hoth’s dip for fruit. It looks simple and quick and will dress up fruits you may wish to use as a dessert. We thank New Vision Community Church for sharing their delightful book of recipes with us. 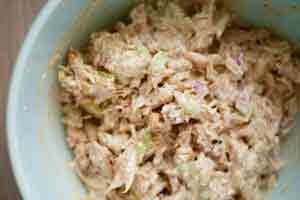 Place crabmeat in bottom of a container that has a tight fitting cover. Spread onions over crabmeat. Shake seasoning over onions and crabmeat. Pour oil, vinegar and ice water over this in the order listed. DO NOT STIR. Cover and refrigerate at least 24 hours. Stir before serving. This is a super salad. Note: Claw or flaked white meat may be used, but the taste is not as good as lump meat. Combine all ingredients. Toss lightly. Serve over lettuce. Garnish with watercress or parsley. Serves 6. Mix ingredients for the sauce well. Cover chicken pieces with sauce in a casserole dish. Bake uncovered at 325 degrees for approximately 2 hours or until juices run clear. Fry pork chops in skillet until brown, trim off fat. Place alternate layer of potatoes, onions, and cheese in greased casserole dish. Combine mushroom soup, milk and seasonings in separate bowl and blend well. Pour soup mixture over cheese. Top with pork chops. Cover and bake in preheated 350-degree oven for 1 hour and 15 minutes or until potatoes are done. Scrub potatoes and rub skins with oil. Bake at 400 degrees for 1 hour or until done. Allow potatoes to cool to touch. Cut in half lengthwise, carefully scoop out pulp leaving 1/4 to 1/8 inch shell. (Save pulp for other uses.) Cut shells in half crosswise and deep-fry in hot oil 2 minutes. Drain on paper towels. Place skins on baking sheet. Sprinkle with salt, cheese and bacon. Place under broiler until cheese melts. Serve with sour cream. Arrange asparagus in a steamer basket over boiling water. Cover and steam 8 minutes or until crisp-tender. Plunge asparagus into ice water; drain. Saute red pepper strips in 1 tablespoon hot oil in a skillet over medium-high heat until crisp-tender. Plunge pepper strips into ice water to stop the cooking process; drain. Place asparagus spears and pepper strips in a large shallow dish. Combine remaining oil, wine vinegar, and remaining five ingredients; pour over vegetables. Cover and chill at least 8 hours; serve with a slotted spoon. Mix all ingredients by hand. Pour into greased pie dish. Bake at 350 degrees for 30 to 40 minutes. This pie makes its own crust. In an electric mixer, beat Fluff and cream cheese, adding pineapple juice to taste and desired consistency.